In recent days Ron Unz’s article Race, IQ, and Wealth (The American Conservative) has been making the rounds in the HBDsphere. Broadly speaking it argues for the predominance of cultural and environmental factors as opposed to genetic in forming IQ. It is fairly long but it’s also one of the best statements of that position out there, and I highly suggest you go and read it in its entirety (as well as the good discussions it spawned at thanks to hbd* chick, Peter Frost, David Sanders, etc). In support of his thesis Ron Unz cites the wide dispersion seen in IQ results for European populations, which are genetically close. Many East-Central European societies that scored low during the 1950’s-80’s have since come close to converging with results from Western Europe. Furthermore, South Europeans and East Europeans who migrated to the US in the 1920’s scored in the mid-80’s – a 1 S.D. discrepancy that is about as big as that which continually separates Blacks from whites. I.e., very significant. However, these folks all managed to integrate into American society and now have IQ’s higher than those of longer established (and more rural) groups such as the Germans and Dutch. In particular, he cites a test administered to 3,500 Irish schoolchildren in 1972, which showed an average IQ of just 87. That is almost 1 S.D. lower than the IQ of Irish-Americans, or for that matter, more recent PISA results which now show the Irish to be well within the European cognitive mainstream. (1) It is important to emphasize that Lynn and Vanhanen basically collate a wide variety of tests across space and time that are non-standardized. Some measure verbal ability (which Europeans are good at and generally hasn’t risen much); others measure spatial or mathematical abilities (which East Asians are better at than Europeans, and which was very much influenced by the Flynn Effect throughout the 20th century). Many of their tests suffer from small and/or biased samples – and I imagine this would be especially true of IQ tests conducted in East-Central Europe. That said, the results of these tests cannot be dismissed out of hand, because of their relative consistency. (2) As regards US data on immigrants’ IQ from the 1920’s, we cannot also exclude the (artificial) effects of poor English language comprehension. Certainly we know that liberal arguments against the validity of IQ tests emphasizes that the tests in that period were linguistically rigged against immigrants and if that is true then it would make sense that their scores were “mismeasured”. Had I been subjected to a verbal IQ test in English in 1995, say, I would have come out as a clinical retard. (3) That said, the low Irish results from 1972 are indeed puzzling and deserve a detailed response. THAT SAID, before rushing to ascribe to the difference in development levels, we must also take note that Ireland before the 1975 was a very high-emigration country. Note that Ireland’s population was actually declining until 1960, despite births outnumbering deaths by almost 2:1. More than 1% of the Irish left their country every single year. The schoolchildren of 1972 would have presumably been born for the most part in the 1950’s, not far from the end-point of a (likely dysgenic) process that had been going on uninterruptedly since the Great Famine. While there is no way to know for sure, there is reason to suspect that on average emigrants had higher IQ’s than average, as the act of emigration requires initiative, fore-planning, future time orientation, and other factors usually associated with higher IQ’s. Operating for a century this would have surely had a dysgenic effect, but fortunately on its cessation, the population would get a chance to revert to its natural mean. Coupled with big infusions of Poles and other East Europeans during the 2000’s, and the undeniable but modest boost that great wealth can make to IQ, it is probably not that surprising that in the PISA tests the Irish have converged with the West European mainstream. Note that according to my estimates derived from PISA/TIMMS and Rinderman’s, even today countries with ultra-high rates of emigration such as Moldova (86/92), Georgia (83/88), Armenia (96/93), and Kyrgyzstan (75/70) also have extremely low IQ results relative to where we would intuitively expect them to be. Armenians are the closest genetic relatives of Ashkenazi Jews, who are (in)famous for being well above average; furthermore, Armenians have typically been more educated than average, and quite a lot of Soviet chess Grandmasters were Armenian or part-Armenian. Moldovans are crudely East Slavs and Romanians, and “should” be somewhere in the low 90’s (although note that both Ukraine and especially Romania have had very substantial emigrations of their own). Georgians are crudely Greeks and Turks, and basically something like a fourth of them left – both during the Soviet era, and especially during the 1990’s. The Kyrgyz are a Turkic and Mongoloid-like people, and as with the Georgians, about a quarter of them have left for greener pastures. Though it should be noted that Kyrgyzstan has one of the highest rates of consanguineous marriage in the world (i.e. inbreeding) and that this is surely a huge additional depressant on their IQ. In short, PISA data suggests that mass emigration – especially when ongoing for a long time – has a very significant dysgenic effect on IQ. I do not think it unreasonable to posit that this is the reason why 3,500 Irish schoolchildren scored an average of 87 in IQ tests held in 1972. (4) While I agree with hbd* chick’s observation that the emigration had a significant dysgenic effect on Irish IQ (see above), unlike her I think that it has been almost entirely remedied by now. She argues that Irish PISA scores only managed to converge with those of France because of its flood of lower-IQ immigrants that brought the national average down. The data doesn’t back this up however. Ireland’s native PISA score in 2009 was 503 (national – 497), not really ALL that different from France’s 508 (497), the UK’s 508 (500), Poland’s 503 (501), etc. (5) Extrapolating from these spatio-temporal discrepancies in IQ among West European populations, Ron Unz extends the exercise to Mexico and Hispanic immigration in general. He notes that among Mexican-Americans born in the US, the average IQ as derived from Wordsum improved from 85 (i.e. Third World) to 95 (i.e. basically just about enough to build a First World society). This is substantially higher than the average for Mexico today which is something like 88 (me) or 85 (Rinderman). This is of course highly encouraging. Possible problems. First, what kind of Mexicans? There are huge disparities between the northern predominantly European states, which are basically something like Portugal, to the southern predominantly Amerindian states, which look more like India. Think of it like Italy Extreme (where IQ ranges from 103 in the northern states to low-90’s in the south). As I understand it, the older migrations was primarily from the former region; indeed, part of the Mexican-American population is indigenous, having been conquered in the 19th century. But it is a fact today that Hispanic migration is primarily from southern Mexico and Central America. Will they be as successful in converging to the American average like Europeans and the old Mexican-Americans? Second, read David Sanders’ response at VDARE. Overall Hispanic scores have remained low, typically in the low 90’s (unfortunately, Sanders seems to conflate Mexican-Americans with Hispanics, which is not really accurate at all; but the main point stands). PISA confirmed those figures both in 2006 and 2009. Part of this stagnation is surely due to the continuing influx of poor Hispanics with bad English skills. Nonetheless, I am not sure it is possible that it is still the main reason today. After all, the US Hispanic population is now very big, at around 16.3% of the total population according to the last Census. As such the influence of new arrivals on the overall group average is now surely quite modest. Main things to take home. First, if Hispanic average is low 90’s and Mexican-American average is 95, then Hispanic non-Mexican average is probably something like 90. Flynn magic and acclimatization to America may raise it to 95, while Mexican-Americans may eke out a few more points. Still, hard to see them catching up to the US White average of 103 anytime soon. Encouragingly, this is not the kind of awning difference that leads to quasi-caste societies like in South Africa, on the other hand, the differences will still be significant and not helped by the fact that Hispanic culture is quite different from mainstream US white culture. There is a France and an Israel. Lynn and Vanhanen’s data is valid for general conclusions because at the large scale noise is smoothed out, but it is very dangerous to use it to illustrate individual examples. Even today, if you look at the geography of PISA test results in the US – a STANDARDIZED test to boot, unlike the IQ tests compiled by L. & V. – there will still be significant differences even in White results which range from about 96 in West Virginia to 106 in Massachusetts. This is perfectly natural and to be expected because of internal migration and cognitive clustering patterns that have lasted decades and centuries. Several things we have to bear in mind: (a) Ultimately modest initial differences (especially once we account for linguistic issues in the 1920’s immigrant tests discussed above); (b) Intermarriage which has been very substantial and smooths out ethnic differences in the urban areas; (c) Unz’s own observation – with which I’m fully agreed as it seems to be universal! – that urban dwellers tend to perform better on IQ tests than rural dwellers all other things being equal (as Marx observed: “Idiocy of rural life”). (8) I notice that Ron Unz steers clear of the elephant in the room as regards theories of IQ as predominantly a product of culture – US Blacks. Problem is, they are more urban than whites; so can’t use the reasoning in the previous point. And as discussed very extensively in The Bell Curve (Murray & Herrnstein), no, this is not because IQ tests are culturally biased or because Blacks just don’t care about them. US Black IQ’s be they derived from SATS or PISA or other tests pretty much all now consistently show them as being in the high-80’s. The Black White gap shrank slowly until the 1990 but since then progress has stalled or even reversed. The sad but logical conclusion is that their genetic IQ potential as a group is now more or less maxed out. It would be interesting to see how Ron Unz would try to explain this away. Another element of Lynn’s and Vanhanen’s more recent work (e.g. The Global Curve) that has not been tackled is the remarkably consistent tendency for the exact same racial patterns to reproduce themselves all over the world in different countries and within radically different cultural milieus and across time that feature similar hierarchies in economic success, crime, IQ, etc: East Asians, then Whites, then South-East Asians, Indians, and/or Hispanics; then Blacks. It is hard, very hard indeed, to think of any theory that can account for this that doesn’t lean heavily on genetic determinism. Despite all these caveats and criticisms, it need be borne in mind that only a pure ideologue would argue that IQ is solely genetically determined. Indeed, the Flynn Effect – mostly composed of better nutrition (we can deduce this partly because it is the poorest performers who tend to make the biggest gains, and that furthermore, the Flynn Effect petered out in White countries at just about the time that their average human heights reached a plateau) and various other things such as familiarity with standardized tests – is very significant, typically adding a massive 15-20 IQ points overall (compare US Blacks with scores in the high-80’s, adjust down to 85 to take into account 20% white admixture, then consider that the Ghanans, Nigerians, etc. among whom Flynn hasn’t had much chance to take root yet, score around 65-70). Also of huge significance is the geography of cognitive clustering which has been discussed here in the context of dysgenic emigration, as well as in the cases of some countries, the culturally-mediated factor of consanguineous marriage (which however takes a long time to fix even disregarding the cultural barriers to dismantling such systems). In an addendum to the initial article, Ron Unz writes about The East Asian Exception to Socio-Economic IQ Influences. He notes that while (Flynn-adjusted) South and East European scores improved form the 88-94 range, this was much less true for the East Asian nations which started off with very high scores even in the 1950’s and 1960’s and only made very marginal improvements to the present day. Ironically, Unz’s explanation for this is primarily genetic and I DISAGREE with it. The most plausible inference from these decades of accumulated data is that the IQs of East Asian peoples tend to be more robust and insulated against the negative impact of cultural or economic deprivation than those of European groups or various others—a truly remarkable finding. This might be due to cultural factors of some type, or perhaps certain aspects of East Asian spoken or written languages. But a fascinating possibility is that this IQ robustness may have a substantially genetic component. … Over one hundred years ago, The Changing Chinese by A.E. Ross, one of America’s greatest early sociologists, provided copious anecdotal evidence indicating greater Chinese resistance to illness and injury and perhaps even an ability to survive on more meager food rations. Certainly these sorts of traits might be expected to have undergone strong selection in a country such as China, whose huge population had lived many centuries at the absolute Malthusian edge of starvation. (a) While on paper East Asian GDP’s – especially outside Japan – were indeed quite a lot lower than those of Southern and Eastern Europe in the 1950’s and 1960’s, it does not necessarily follow that there was a huge corresponding difference in food availability. Asian agricultural technology was always advanced relative to their actual level of economic development, and their diets were probably better balanced than in the Mediterranean and almost certainly better balanced than in East-Central Europe. (b) Sampling issues. This requires further investigation, but it is very important to be nationally representative given cognitive clustering. 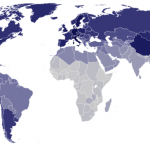 E.g., people are far brighter in Shanghai or Beijing than in Henan. (c) “For consistency, all these results are drawn directly from Lynn/Vanhanen, and include their Flynn and other IQ adjustments up and down, several of which seemed rather large and arbitrary…” I.e., if the Flynn adjustments seem “rather large”, then logically the earlier IQ results should be lower than otherwise stated; and hence, the gain thanks to the Flynn Effect correspondingly larger. (d) In a famous book on China by the American missionary Arthur H. Smith, titled “Chinese Characteristics” and published in the 1890’s, he expresses a low opinion of Chinese intellectual acumen at the time. In a chapter tellingly called “Intellectual Turbidity“, he notes that the great mass of Chinese are seemingly incapable of abstract logical reasoning, WHEREAS Chinese scholars – though understandably few in number, considering the country’s underdevelopment – can display impressive intellectual acumen. This makes total sense given what we now know of psychometrics and life in traditional societies. The masses have peasant-like mentalities and are illiterate and malnourished, which translates into very low IQ’s; the scholars, however, are fairly well nourished and literate and urban and high-IQ, and thus can communicate at Smith’s level. However, as there are so few of them, the characteristics of the dull peasant masses predominate at the average national level so the national IQ level is very low. Today however the Chinese IQ is well above 100 however you measure it. This is the Flynn Effect in action over a century, in China as everywhere else. So, East Asians probably aren’t as much of an Exception as Ron Unz presents them as. Or not an exception at all. Arguably using them to try to prove that Lynn and Vanhanen scored a “game-ending own goal” is kind of an own goal to Unz’s own minimization of the genetic component of IQ. In conclusion, I think the Flynn Effect DID act on East Asian societies, though it is plausible that it was not to such a high degree as in European societies for cultural, environmental, or genetic reasons. And as with Europeans they have now maxed out their potential (Japan, Korea, Taiwan) or come close to it (China). However US Blacks also seem to have maxed out their potential and at levels very significantly (1 S.D.) below those of both US Whites / Anglo-Germanic Europe and East Asians. Coupled with lots of other evidence this to me convincingly suggests a strong racial component to group average IQ differences. Mexican-Americans and especially US Hispanics (who still have many immigrants among them) can still make very substantial gains but given the very big gap between them and US Whites, I am skeptical that they will be able to close it it in the future by themselves. That said intermarriage rates between native-born Hispanics and non-Hispanics are quite high so I expect them to gradually blend in with the US population over the next century. Perhaps a more critical difference from prior European immigrants apart from the lower IQ of Amerindian-stock Hispanic immigrants is that they come from or via a nation contiguous with the US. This lack of distance means that they will be better able to maintain their culture within the US, and the US will slowly become a more “Latinized” country although they will not ever feasibly come to exercise a dominant cultural influence.